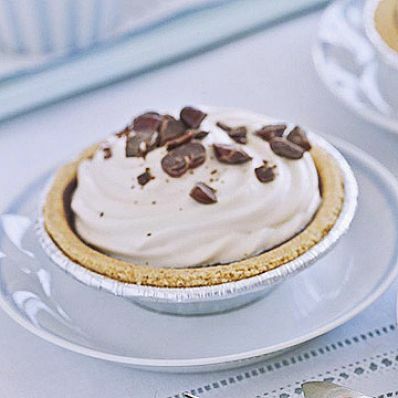 For a quick and easy dessert recipe that caters to coffee lovers, pipe or spoon creamy coffee filing into purchased tart shells. Line the shells with a thin coating of coffee-flavored chocolate before adding the filling. 1 of 2 In medium-size bowl, combine chocolate chips and oil. Microwave on high 1 minute. Stir until smooth; stir in coffee granulescoffee does not have to dissolve completely. Spoon 1 tablespoon melted chocolate mixture into each tart shell, rotating shell so that chocolate coats bottom and sides. Use a spoon to help spread, if necessary. 2 of 2 Place yogurt in large bowl; stir to blend. Fold whipped topping into yogurt until no white streaks remain. Spoon mixture into a pastry bag fitted with a large star tip and evenly pipe mixture into each tart. Or spoon a generous 1/2 cup mixture into each tart shell. Evenly sprinkle tops with chopped coffee beans. Refrigerate 2 hours. Per Serving: 94 mg sodium, 1 g fiber, 18 g Fat, total, 39 g carb., 5 g pro., 331 kcal cal., 10 g sat. fat, 3 mg chol.